Reflections of Tao Ribbons at MQX East! Yes, I have been away from blogging for a while — no better time to restart than with happy news to share! My silver quilt ‘Reflections of Tao’ is at MQX East in Manchester, New Hampshire. 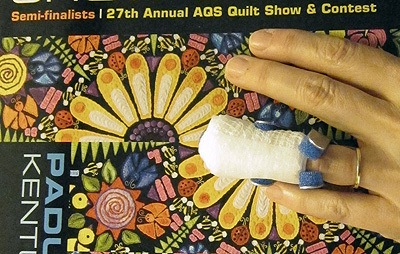 The show is open from Thursday 4/10 to Saturday 4/12, and there are hundreds of amazing quilts on display and lots of fantastic vendors — be sure to visit if you can. 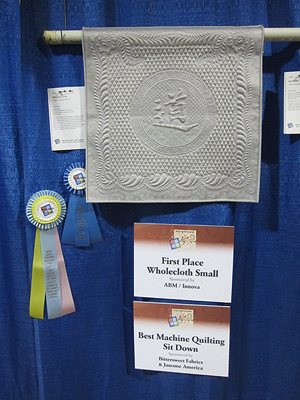 I attended the awards ceremony and was excited to find out that Reflections of Tao won first place in the category of small wholecloth quilts. 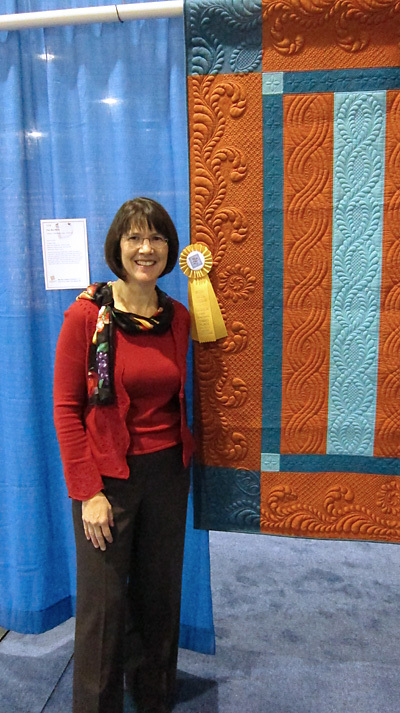 I was stunned and thrilled when Reflections of Tao also won Best Machine Quilting of the ‘Sit Down’ quilted quilts. This little quilt is 24″ square – I think the signage and ribbons are almost as big as the quilt! You have to see this quilt in person to appreciate the subtleties and shading created by the many different colors of silk thread I used. 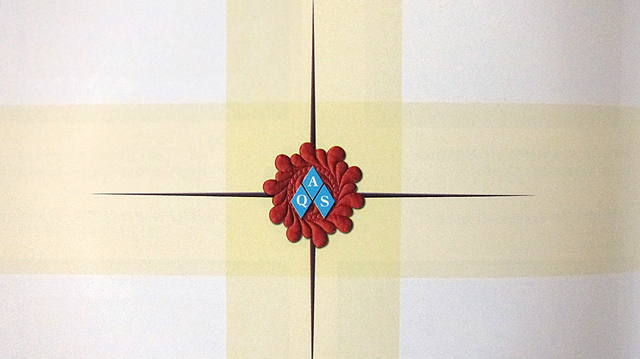 I also used trapunto to create more dimension in the major motifs. The wholecloth quilts are hanging in the Armory at the Radisson – you’ll see the Expo Center when you first arrive, but the Armory is the smaller, cozy exhibit and vendor hall on the other side of the hotel area. I hope to see you there! MQX East Awards Ceremony and Sneak Peek! We drove down to Providence to attend the Awards Ceremony yesterday afternoon, and were able to take a ‘Sneak Peek’ at the show, special exhibits, and vendors. 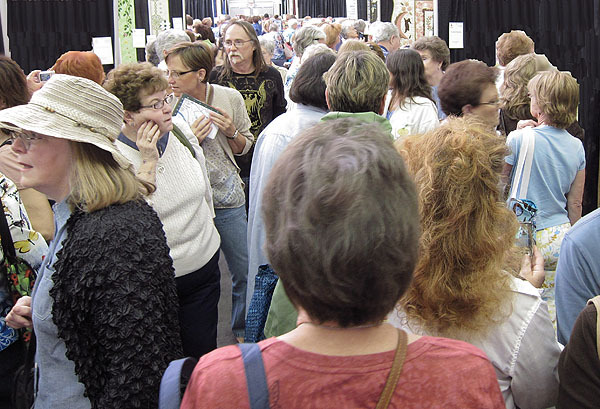 What a great show – if you can get to Providence by Saturday April 14, go to MQX East! 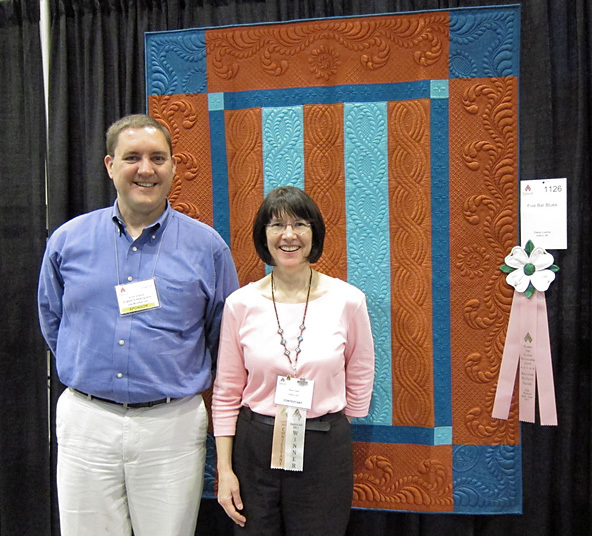 Five Bar Blues won 3rd place in the Large Wall Quilts – Traditional category! I was thrilled my quilt was honored – this category is full of stunning quilts by talented quilters. The exhibit was hung so that the backs of all the award-winning quilts – and many others, as well, were open and visible as we walked through the exhibit. Sometimes you couldn’t tell the back from the front – and because of the remarkable machine quilting, many of the backs of the quilts were at least as beautiful as the front of the quilt. I have not attended a quilt show hung this way before and it was a treat to be able to easily see both sides the quilts. 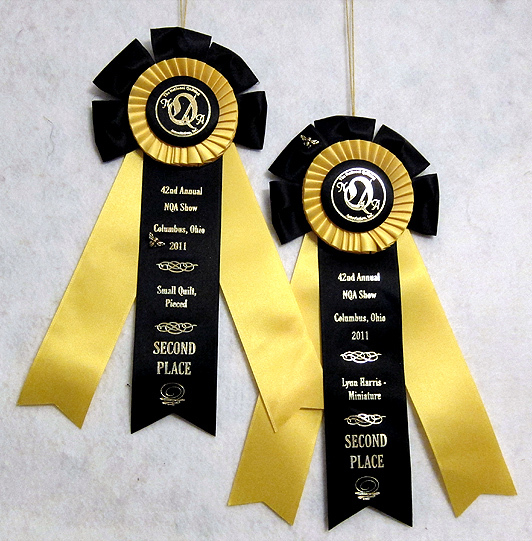 The full list of MQX East 2012 award winners is available on the MQX website. For a sneak peek at the show, MQX also has live webcams on the MQX show floor!